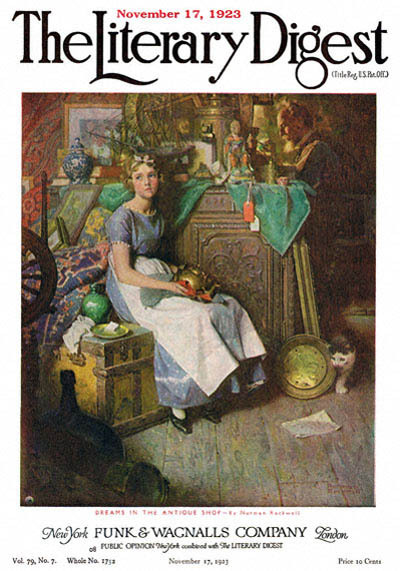 Dreams in the Antique Shop, this Norman Rockwell painting, appeared on the cover of The Literary Digest published November 17, 1923. The alternate title for this painting is Woman Daydreaming in Attic. This illustration was Rockwell's forty-sixth picture featured on the cover of The Literary Digest. Begining in 1918 with his first cover illustration, Boy Showing Off Badges to the last, The Night Before Christmas in 1923, a Norman Rockwell painting was published on The Literary Digest cover a total of forty-seven times. The original oil on canvas painting, 35 x 30 inches or 89 x 76 cm, is part of the collection of Bay Path Junior College. This illustration was also reproduced on page 62 of Norman Rockwell, A Definitive Catalogue by Laurie Norton Moffatt and republished on the cover of the November 1946 issue of The Grade Teacher. With this painting, Norman Rockwell portrays a young woman lost in her thoughts. She seems oblivious to her surroundings. The viewer is left to ponder where she is visiting in her thoughts. Dreams in the Antique Shop was only one of 47 Norman Rockwell Literary Digest covers; here is the list of more Norman Rockwell Literary Digest scans. The young woman has paused right in the middle of polishing a brass object. Her boss, the antique shop owner, is right around the corner. He is either working on the books, pricing or evaluating a new acquisition and doen't notice her. Almost as if on cue, the store cat is coming into view. The cat is about to knock over a piece of brass that the young woman has just polished and set aside. Her daydream is about to be interrupted. Other points of interest in this painting are the many and varied antiques Rockwell has depicted for sale in the shop. We see picture frames, a spinning wheel, jars, vases, figurines, drapes, tapestries and, of course, polished brass. The detail of the woodwork on the side of her boss's desk is beautiful. Norman Rockwell's attention to detail really shines through with this painting. Any antique collector would love to visit this shop. Almost as much as he/she would love a copy of this Literary Digest cover.